I'm currently using retin-A and sulfur 10% biosulfur 1% face wash for my cystic acne that I've suffered from for 9 years. I've got it mostly under control, but I have really awful scarring and hyperpigmentation. I'm going to use a 15% at home TCA peel for my hyperpigmentation, but I need to know what type of needling is best for the raised scar on my nose and near my nose, the pitted scars and large pores on my cheeks, and my small forhead bump scars. 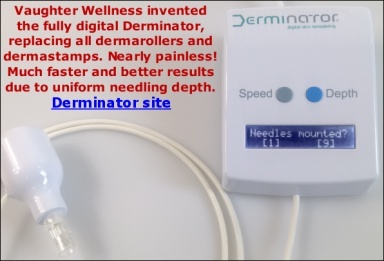 I read about the derma stamp, roller, and single needles, but I'm still debating. What size is best? Where do I get individual needles ( if that's what I need). Should I use a 1 mm derma stamp for my whole face or a single needle for the near nose scar and a derma roller for the rest of my face? Also, should I do the TCA after or before needling? How bad will my face look (because I can't avoid being out in public, I'm in college) after derma rolling, needling, or stamping? How long will it take to heal? And lastly, what can I do to prevent hyperpigmentation while needling? My skintone causes me to be prone to it. I've attached pictures of my scars for reference. Will try. Thank you very much. If going out in Public is something you can't avoid, you should try a Salycic Acid peel instead of TCA. With a TCA, you'll definitely need to stay indoors. A couple of Salycic acid peels is the equal of a weaker TCA peel. However you can do Salycic acid peels more often and they clean up the skin nicely and clear your pores out so you're preventing future breakouts at the same time.